On Saturday, I got a large squishy package from E. Brown, my scrap exchange partner. My hubs got the mail while I was out and he put it all in his "office" and he didn't tell me about the package until I was ready to go to bed! Dang. I waited until Sunday to open it and explore. What fun! I had let E. know that I was in a "yellow" phase. When I was visiting my daughter in April in Berlin we went out to a Thai Restaurant (I think, I mean it was in German, so I'm not really sure) and they served fortune cookies (? ), anyway my fortune said (in 4 languages) "The color yellow will bring you luck." So she obliged with some lovely yellow scraps. The ones that caught my eye were the lovely pink and orange houses. I picked out more yellow, pink and orange to go with them and also some blue as a complement. And I got to thinking about a grid or city plan or Town Square to put the houses all around, so I added some green for parks and some taxis to get everyone around and a rhino because he was yellow and this was the result . 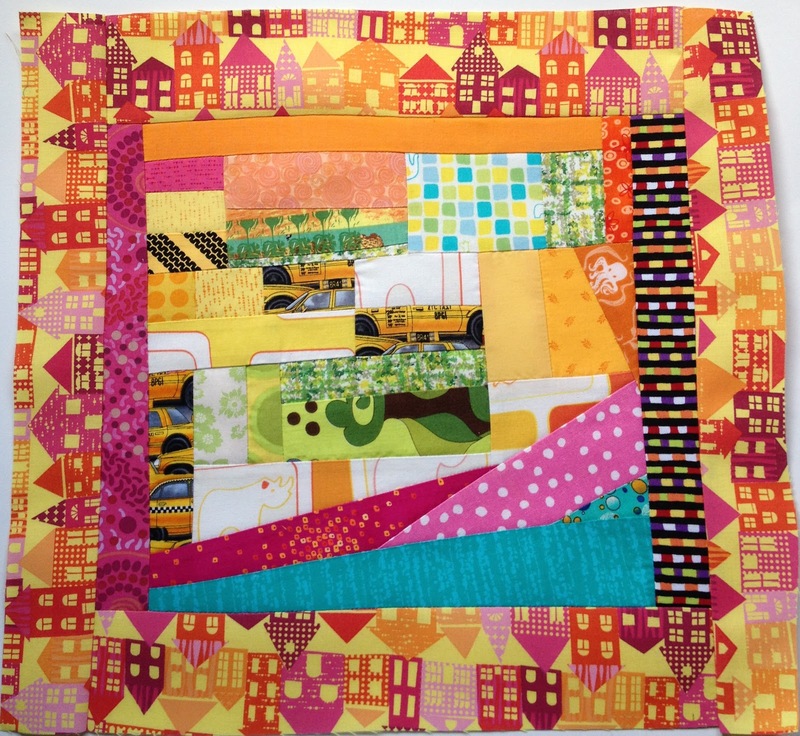 . .
A sweet little mini quilt top. It will have a place of honor in my sewing room because I love playing with scraps, especially if they are not mine!!! Thank you Earamichia (and Victoria for the great idea). I have those yellow houses! I have them in blue as well! What a great block!! I love the little houses too - perfect for your border. Great block! Love the house border, too!